Tacos are the beating heart of Mexico’s food scene. Take your pick from 65 authentic recipes for these little pocket rocket wraps, brought to you by Felipe Fuentes Cruz and Ben Fordham of Benito's Hat, Burritos and Margaritas. Tacos are the beating heart of Mexico’s food scene. Take your pick from over 65 authentic recipes for these little pocket rocket wraps, brought to you by Felipe Fuentes Cruz and Ben Fordham of Benito's Hat, Burritos and Margaritas. From simple supermarket kits to high-end restaurant revamps, a whole spectrum of taco offerings now exists for your pleasure. These small but mighty Mexican staples are finally getting the credit they deserve on the worldwide culinary stage. 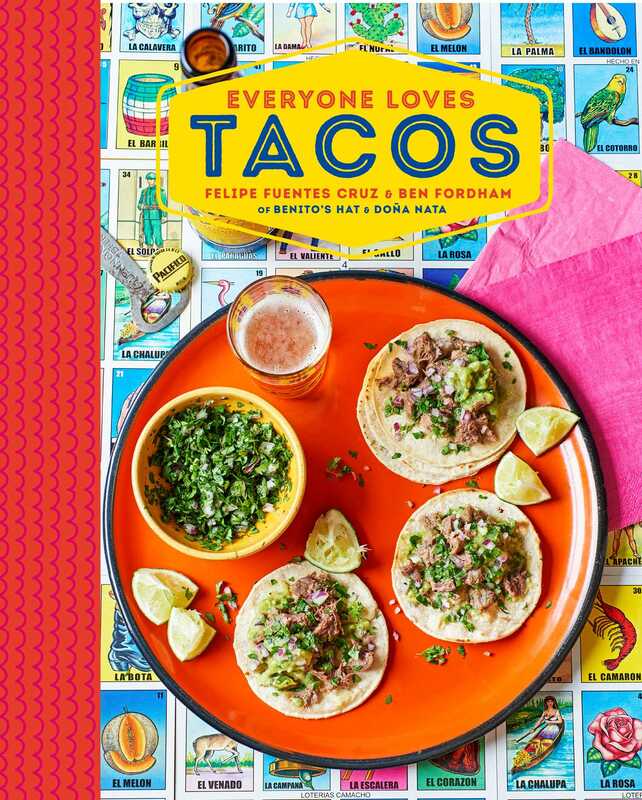 With this book, you can bring the buzzing atmosphere and high-quality eating experience of street food tacos into the comfort of your own kitchen. Explained simply, a taco consists of a tortilla, filling, salsa, and garnish. The salsa is an equally key component to the filling—fresh, zingy flavors are carefully selected to complement the other elements perfectly. The clever guys behind authentic Mexican kitchen Benito's Hat bring you delicious recipes simple enough to cook up a fiesta in your own kitchen. First there is a chapter of Little Cravings (antojitos), perfect as a pre-cursor or accompaniment to a taco feast. This is followed by a delicious selection of Breakfast Tacos. Next up is a mouth watering selection of Chicken, Pork and Beef Tacos and following these are Fish and Seafood Tacos. Inventive Vegetarian Tacos such as Deep-fried Avocado or Turmeric and Potato really hit the spot, then discover the bliss of a Sweet Taco with recipes such as Chocolate Ice Cream with Agave. A chapter on Salsas, Relishes and Sides, such as the classic Pico De Gallo, lets you mix and match. Felipe Fuentes Cruz was born in Puebla, Mexico and has worked in the US, Spain and now London. While working in a Mexican restaurant in 2006, he met Ben Fordham, who had fallen in love with real Mexican food when he lived in Texas. They had the same dream of bringing great Mexican food to London and in 2008, Benito’s Hat was born. Felipe Fuentes Cruz was born in Puebla, Mexico and has worked in the US, Spain and now London. While working in a Mexican restaurant in 2006, he met Ben Fordham, who had fallen in love with real Mexican food when he lived in Texas. They had the same dream of bringing great Mexican food to London and in 2008, Benito's Hat was born.